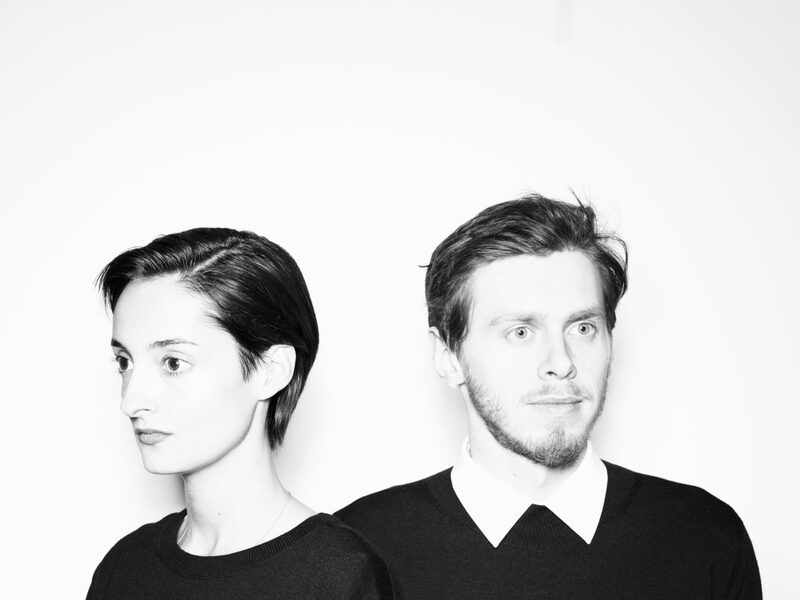 Ana Relvão and Gerhardt Kellermann see themselves as industrial designers. Regardless of whether they are designing coat racks, shelves, stools, kitchens, glasses or spaces, they always aim to carve out the essence of the object in the design process. But what exactly does that mean? And how do they go about doing it? 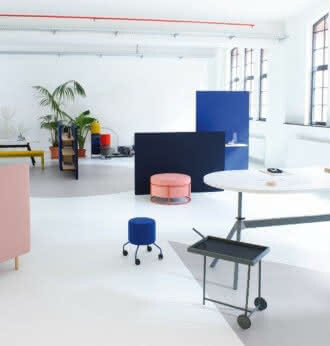 A visit to their studio on the fourth floor of a rear building on Munich’s Landwehrstrasse provides answers. 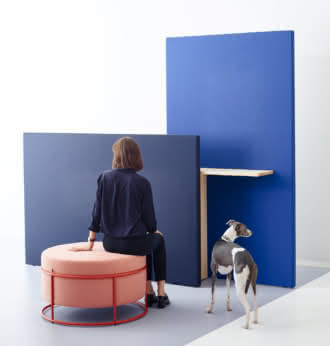 After being welcomed by the elegant Whippet Ada, who then retreats to under her blanket on the two-seater sofa by Dieter Rams, we look around the studio together. In addition to the entrance hall and the work space there is a small windowless room with several 3D printers working away. The two designers use these a lot in order to quickly visualize initial ideas in 3D and test their function. The technology is second to none, Gerhardt Kellermann says, but of course they still also build cardboard models, too: “The advantage of using a 3D printer is that you can make something quickly and fine-tune it.” A printed model is also helpful in showing clients where things are going during the early development stages – especially when collaborating with engineers, who often tend to only build a prototype when the solution seems meaningful in technical terms, too. In order to show me precisely what this involves, Gerhardt Kellermann walks up to the window sill, on which there are several objects, and picks up a lip balm stick designed by Ana Relvão and a triangular glasses case. And it immediately becomes clear: Holding the object in your hands says more than long explanations. 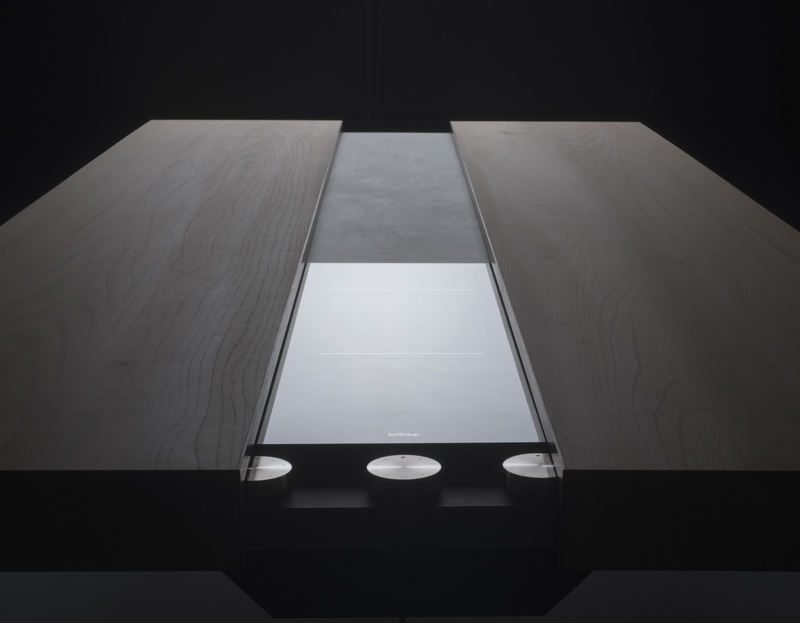 The "Solitaires Cooking Table", which RelvãoKellermann designed for Bulthaup. 3D printing is appropriate if only because the couple uses computers a lot when creating their designs, and enjoys using new technological tools in general. When it comes to designing spaces, they even use VR glasses – as is the case for the designs for the exhibition project "Stylepark Selected" the two are currently working on with Stylepark and the MAKK, which will be premiering in Cologne in January. “It’s easier to get a feel for the proportions and distances in a room this way than by looking at a floor plan,” the designers say. If, for example, you’re “standing in front of a seven-meter-high curtain” in a virtual version of the MAKK, “you’ll get an idea of what that would look like.” Ultimately, though, what counts is the result in the actual space. Printed models or VR glasses: convincing people helps, and indeed the two of them know how to convince manufacturers, engineers, and clients. 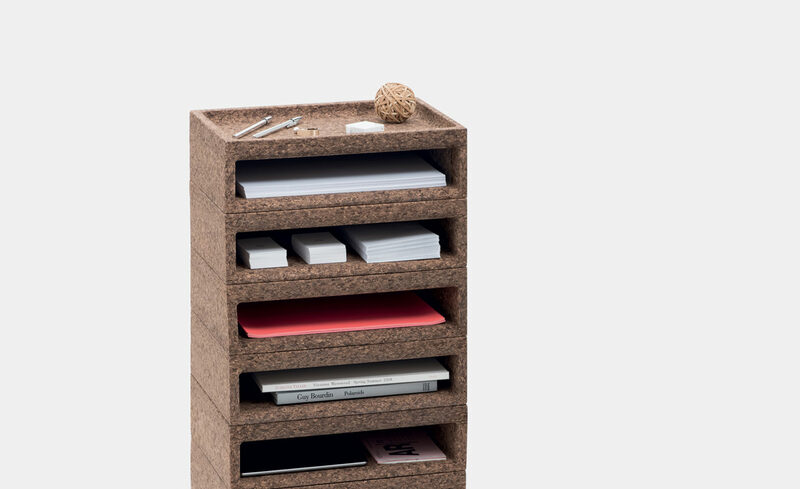 They have been working together for five years now; they have designed for companies such as Bulthaup and Gaggenau, developed cell phone antennas, server rooms and routers for Huawei, and furniture for Schönbuch, Cor and Auerberg. The fact that they are still little known in Germany is due to their having drawn many prototypes we never get to see. Gerhardt Kellermann calls this type of work for the industry “ghostwriting”. 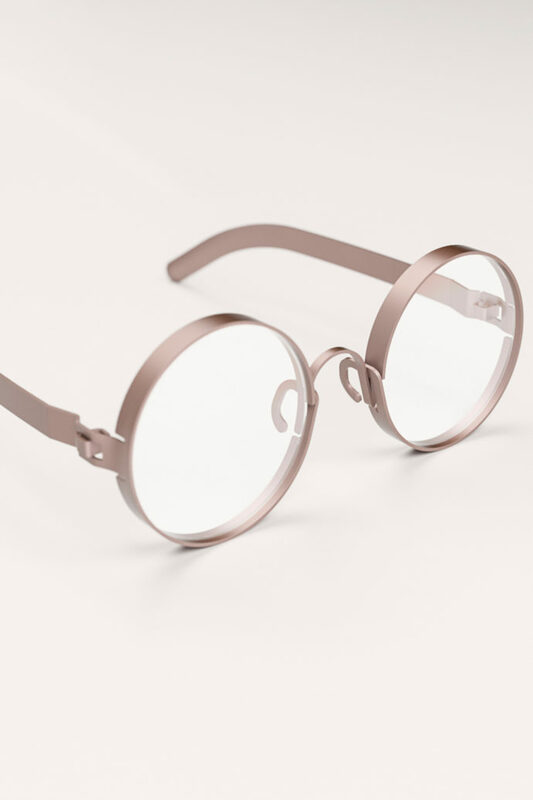 Ana Relvão developed this prototype for glasses. The whole frame is bent from a slim stripe of metal. What this means precisely can be seen with a glasses frame the two developed on their own initiative. 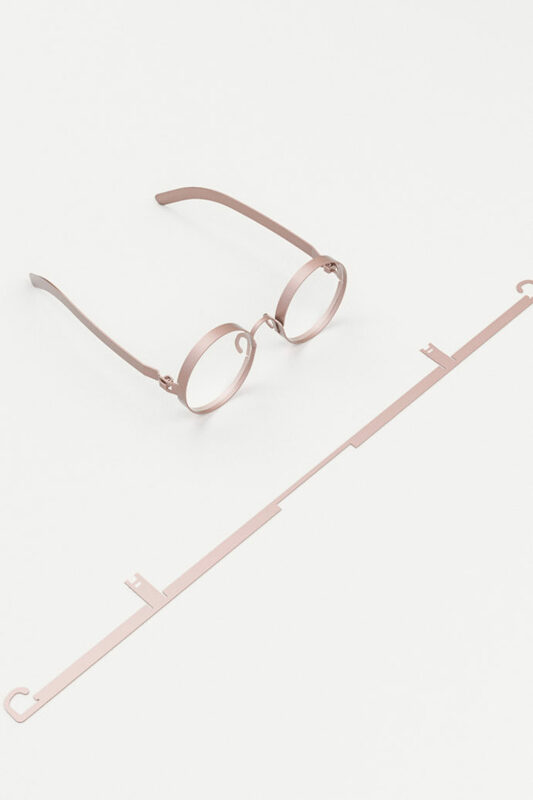 As Ana Relvão explains, “We thought: Why not base the design for the glasses on a line, then bend it into the shape we want? From one piece, and bend it using pliers.” And she adds: “Here too we were primarily interested in the process. The resulting shape was of secondary importance – but we created a new, iconic object after all.” The couple calls projects such as these “lab”: by analyzing production sequences, breaking them down into their constituent parts, they happen upon surprising solutions. Model of the scenographic design Ana Relvão and Gerhardt Kellermann designed for the exhibition project "Stylepark Selected"
As such, the two designers decided to create an experience for MAKK visitors, to display the exhibits and provide additional information about them – all in a calm atmosphere. 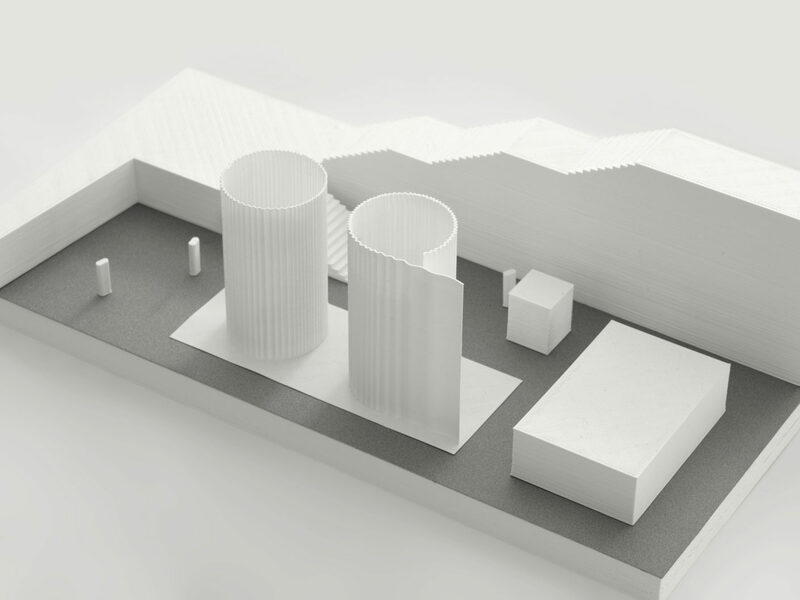 The result: The objects chosen for Stylepark Selected will only be presented virtually, while two walk-in “columns” made of drapes will calm the open museum. In the space created inside the drape columns there will be a glass pyramid, onto which images of the exhibits in question will be projected, thus forming a 3D hologram. In the other, three transparent displays of information about the object. Kellermann calls these spaces “two small curiosity cabinets,” because the drape columns give the space structure and only reveal what is to be seen there once visitors step behind the curtain. “At first glance, a hologram may appear to be a playful gadget, but pared down to the essentials it can become beautiful. Anyone who sees it will be amazed!” says Gerhardt Kellermann, and Ana Relvão adds: “If you’ve got a good tool you don’t need to refine it.” Ada the dog growls approvingly.